"Steve captures the essence of the problems affecting the financial close process within corporations of all sizes; from the period close of subledgers and general ledger through financial reporting, and the relationship and interdependencies of governance, people and technology. A must-read for the corporate controller." —David Taylor, ACMA, MBA, VP Strategy, Trintech Inc.
"Fast Close: A Guide to Closing the Books Quickly, Second Edition is a must-read for today's busy controllers. Steven Bragg points out everything that can be done outside the close that you just never realized didn't actually have to be part of the month-end close process! Very commonsensical approach!" "A well-executed 'fast close' can bring many valuable benefits to any company, from improving organizational performance to transforming accounting executives from financial historians to trusted advisors. 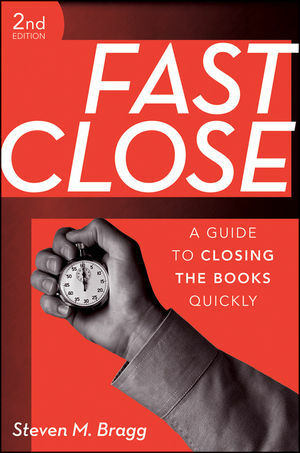 In Fast Close, Second Edition, Steve systematically breaks down the steps required to achieve a fast close in both public and private companies, providing financial executives with tips, checklists, and a cost-effective road map to implement fast close procedures in virtually any company." "This is an outstanding book in which Steve reveals his secrets to a fast close. Having personally experienced his (one-day) fast close for years and enjoyed the beneficial impact on my company, I highly recommend this book for all financial officers who desire to have a large, favorable impact on their company." STEVEN M. BRAGG, CPA, has been the chief financial officer or controller of four companies, as well as a consulting manager at Ernst & Young and auditor at Deloitte & Touche. He received a master's degree in finance from Bentley College, an MBA from Babson College, and a bachelor's degree in economics from the University of Maine. He has been the two-time president of the Colorado Mountain Club, is an avid alpine skier and mountain biker, and is a certified master diver. Mr. Bragg resides in Centennial, Colorado. He is also the author of Accounting Best Practices and Accounting Policies and Procedures Manual, both published by Wiley. Different Types of Fast Close. Benefi ts of the Fast Close. Legal Issues Impacting the Fast Close. Steps to Achieve a Fast Close. Chapter 2 Your Current Closing Process. Additional Closing Tasks for the Multidivision Company. Additional Closing Tasks for the Multinational Company. Additional Closing Tasks for the Public Corporation. Problems with the Closing Process. Chapter 3 Conducting a Review of the Closing Process. Steps in the Process Review. Total Duration of the Closing Process. Chapter 4 Alter the Timing of Closing Activities. Review and Correct Subledger Transactions Throughout the Month. Complete the Bank Reconciliation Every Day. Update the Inventory Obsolescence Reserve. Determine the Lower of Cost or Market. Conduct a Preliminary Comparison of the Shipping Log to Invoices Issued. Update the Bad Debt Reserve. Determine Flexible Spending Account Funding. Reconcile Asset and Liability Accounts. Review Financial Statements for Errors. Complete Selected Financial Reports in Advance. Chapter 5 Revise the Contents of the Financial Statements. Alter the Mode of Report Delivery. Eliminate Cost Reporting from the Reporting Package. Separate Metrics from the Financial Reporting Package. Chapter 6 Optimize the Use of Journal Entries and Chart of Accounts. Convert to Recurring Journal Entries. Centralize Use of Journal Entries. Use Journal Entries to Accrue Expenses Delaying the Close. Use Accruals Only for External Reporting. Standardize the Chart of Accounts. Automate Eliminations of Intercompany Transactions. Chapter 7 Standardization and Centralization. Impact of Standardization on the Closing Process. Impact of Centralization on a Multilocation Accounting Department. Impact of Centralization on a Single-Location Accounting Department. Incorporating Standardization and Centralization into Acquisition Activities. Chapter 8 Closing the Inventory Function. Create an Inventory Tracking System. Reduce the Amount of Inventory. Properly Record the Lower of Cost or Market Rule. Chapter 9 Closing the Billing Function. Bill Recurring Invoices in the Preceding Month. Eliminate Rebillable Expense Processing from the Core Closing Period. Transmit Transactions via Electronic Data Interchange. Chapter 10 Closing the Payroll Function. Automatically Calculate Commissions in the Computer System. Install Incentive Compensation Management Software. Post Commission Payments on the Company Intranet. Avoid Adjusting Preliminary Commission Accrual Calculations. Use a Bar-Coded Time Clock. Use a Web-Based Timekeeping System. Merge Sick Time into Vacation Time. Cap the Amount of Vacation Time to Be Carried Forward. Chapter 11 Closing the Payables Function. Pay Based on Receiving Approval Only. Use Negative Assurance for Invoice Approvals. Have Suppliers Include Their Supplier Numbers on Invoices. Receive Billings Through Electronic Data Interchange. Request That Suppliers Enter Invoices Through a Web Site. Link Corporate Travel Policies to an Automated Expense Reporting System. Issue a Standard Account Code List. Link Supplier Requests to the Accounts Payable Database. Automate Payments for Repetitive Processing. Ignore Supplier Invoices and Pay from Statements. Issue Standard Adjustment Letters to Suppliers. Chapter 12 Closing the Cash Processing Function. Access Bank Account Information on the Internet. Avoid Delays in Check Posting. Install a Lockbox Truncation System. Access Online Check Images from a Lockbox. Chapter 13 Impact of Automation on the Closing Process. Principles of Fast Close Automation. Implement Minor Programming Changes on an Ongoing Basis. Install a Web-Based Timekeeping System. Install a Workfl ow Management System. Install an Enterprise Resources Planning System. Chapter 14 Closing the Books of a Public Company. Quarterly Auditor Reviews and Audits. Chapter 15 Controls for Financial Reporting. Chapter 16 Ongoing Improvements in the Closing Process. Appendix A Comprehensive Closing Checklist. Appendix B Fast Close Policies and Procedures. Appendix C Soft Close Checklist. Appendix D Year-End Close Checklist.